← ¿Cómo le ha ido a España en esta crisis? Fiat money is “money that derives its value from government regulation or law. The term derives from the Latin fiat, meaning “let it be done” or “it shall be [money]”, as such money is established by government decree”. 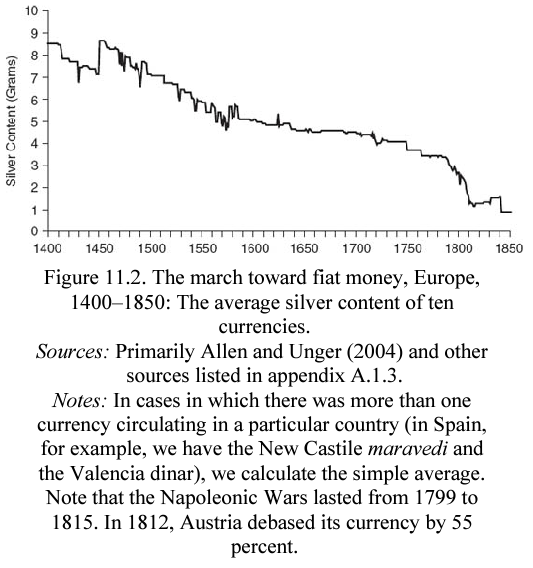 I found an interesting graphic in the book “This Time is Different” (C. Reinhart & K. Rogoff) where you can see how during several centuries governments debased or decreased the content of silver of its currency in order to get over heavy debts. The trend in the graphic seems to point at the “inevitability” of fiat money. The march towards fiat money.